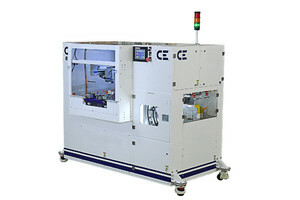 Controls Engineering has designed and manufactured a fully automated carton stacking and banding system. This new system is revolutionary in its versatility, performance and reliable operation. The AP25 stacker will collect product from an up-stream operation such as a carton filler machine. The product collects in the first stage position until a predetermined count is achieved and either indexed into the banding position OR shifted over for the next column/row of product to be stacked. Once the entire bundle is accumulated, the entire bundle is then indexed into the banding position by a high speed stepper motor. The AP25 stacker is coupled with the APT-RC Bander. A fully automated banding machine that will band continuously, 24 hours per day, 7 days per week at a max rate of 25 bundles per minute. Please contact CE to discuss how this, or any of our banding systems, can increase your uptime while reducing your per bundle costs!